Try pairing a beige turtleneck with a J.Crew gold sequin pencil skirt to look stylish anywhere anytime. A pair of gold embellished leather heeled sandals is a never-failing footwear style that's full of personality. For a casual-meets-glam look, try teaming a beige cape coat with a J.Crew Rose Gold Sequin Skirt — these two pieces work nicely together. White cutout leather pumps finish this look very nicely. 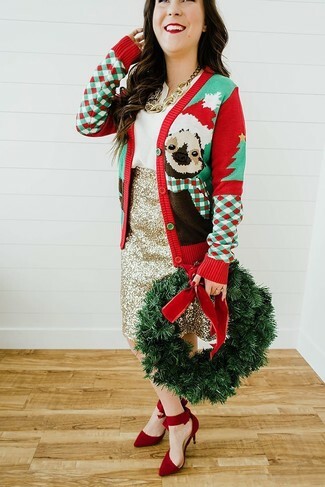 Infuse a classy touch into your current arsenal with a red christmas cardigan and a J.Crew Rose Gold Sequin Skirt from Nordstrom. If not sure about the footwear, complete this outfit with a pair of red suede pumps. 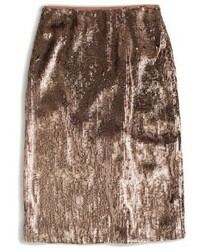 A gold sequin cropped top and a J.Crew Rose Gold Sequin Skirt from Nordstrom are strong players in any woman's closet. A trendy pair of silver leather pumps is an easy way to add an added touch of sophistication to this ensemble. 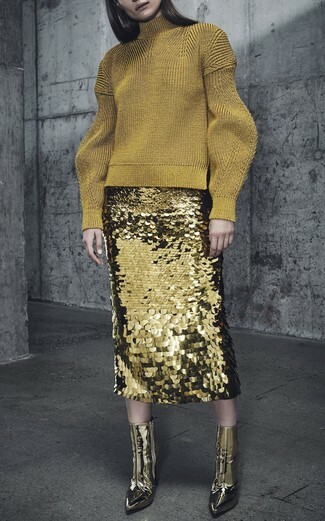 This combination of a gold wool turtleneck and a gold sequin pencil skirt will add a graceful essence to your outfit. A pair of gold leather ankle boots is a goofproof footwear style that's also full of character.